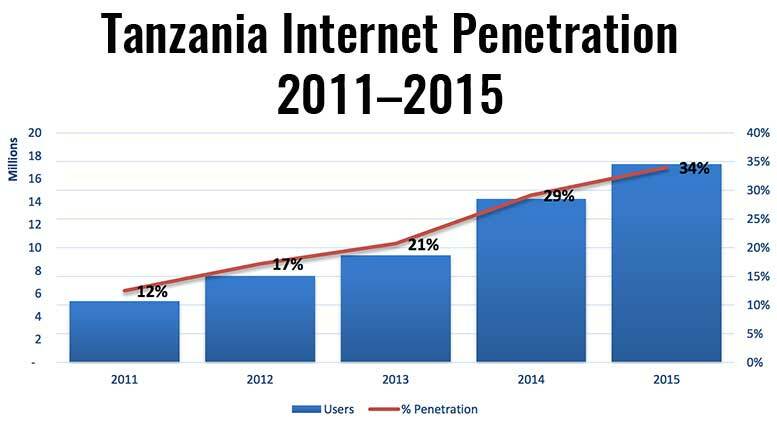 The Tanzania Communications Regulatory Authority (TCRA) recently published its Quarterly Statistics Report for Q4 2015, showing that subscriptions to mobile networks reached 39,665,600, 24.4% more than the 31,862,656 subscriptions registered at the end of December 2014. Total subscriptions by mobile operators confirm Vodacom as Tanzania’s preferred mobile network with 12,714,297 subscribers (+7.6% YOY). Tigo reached 11,115,991 subscribers (+28.8% YOY), overtaking Airtel as the second largest mobile network, with 11,047,505 subscribers (+15.6% YOY). Zantel, the largest mobile telecom operator on the island of Zanzibar, reached 1,835,326 mobile subscribers (+6.7%). Smart reached 1,560,343 subscribers, while newcomer Halotel, part of the Vietnamese state-run mobile network operator, Viettel, which became the 7th mobile operator in Tanzania in 2015, reached 1,226,678 subscribers. All in all, TCRA indicates that Tanzania’s total telecom voice services subscriptions and teledensity was 39,808,419 and 79% respectively. The estimated number of internet users was 17,263,523, with an internet penetration of 34%, and mobile wireless internet accesses accounted for 94.3%, with 16,280,943 subscribers.